A small boat speeds through a body of water with a considerable wake behind it, in the background is an icy coast with a small mound of rock poking out of the snow and ice. 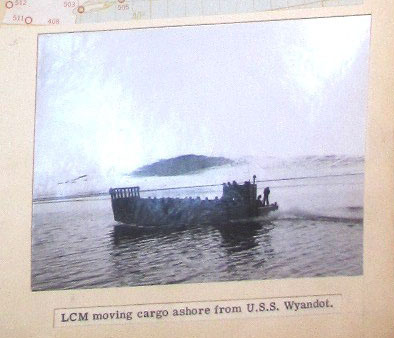 U.S. Navy, “LCM Moving Cargo Ashore From U.S.S. Wyandot,” Exploring Greenland, accessed April 19, 2019, http://exploringgreenland.org/items/show/37.